On the occasion of the LightWave Wavy Awards 10th Anniversary, Tokyo-based LightWave reseller D-Storm interviewed the Oscar-nominated director Shuhei Morita (YAMATOWORKS) to learn more about his amazing career history, creative inspiration and use of LightWave in his anime pipeline. Back in 1999, when he was still a college student, Shuhei Morita joined the CG production company Kamikaze Douga as a 3D CG artist. With the help of Junpei Mizusaki (President of KamikazeDouga) and Disuke Saziki (KamikazeDouga), he created the 3D Animation ioCI, which won the first prize at the 1999 Japanese LightWave Wavy Awards. After his college graduation and following his passion, Morita established his own CG Animation Studio in 2003, Yamatoworks, and teamed up with friends to create the Original Animation Video (OVA) Kakurenbo. Released in 2005, Kakurenbo won several awards such as the Excellent Work Award at the 2005 Tokyo International Anime Fair, Gold Prize at the Fantasy Film Festival of Canada, and the Recommendation Prize by the Examination Committee for the Cultural Affairs Media Art Festival. Following this worldwide recognition Morita joined Sunrise in 2006 as a CG director and created the Freedom Project, which won the Excellent Work Award at the 2007 Tokyo International Anime Fair. He also received an Academy Award nomination for Best Animated Short Film for the movie Tsukumo (Possessions) which he created using the powerful modeling, animation, rigging, effects and rendering tools built into LightWave 3D software to create his beautiful animation. Tsukumo was part of Short Peace's four anime short projects, along with Gambo, A Farewell To Weapon and Combustible. 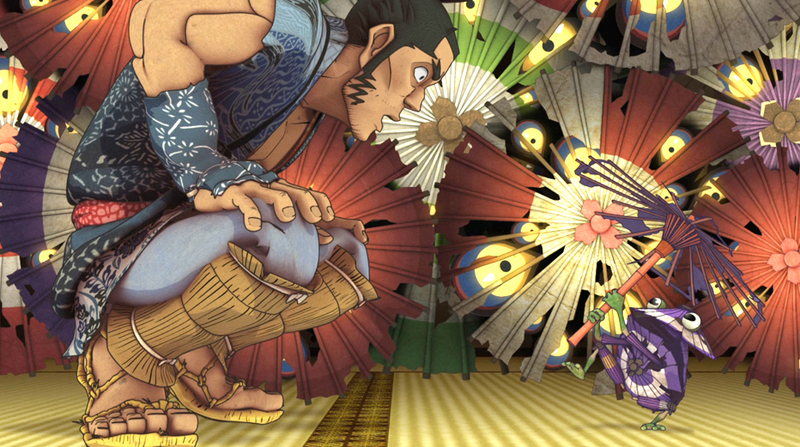 LightWave has been used to create 3 of them (Possessions, Gambo and A Farewell To Weapon), and Combustible was nominated for the 2012 Annecy International Animation Film Festival. Morita-san is also known as a director and writer for Freedom (2006), Coicent (2011), Gatchaman Crowds (2013), Tokyo Ghoul (2014 – 2015) and lately on Chou Kidou Gaiku KASHIWA-NO-HA (2015). 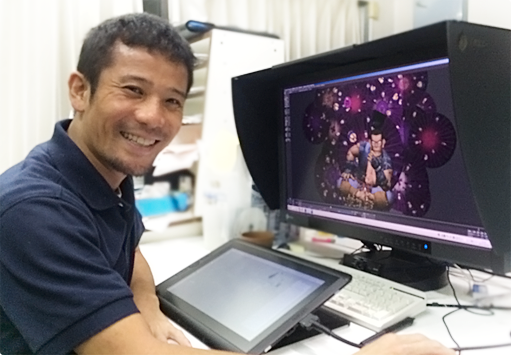 Morita is a much sought after teacher in Japan and when teaching at universities he insists on using his favorite creative tool LightWave exclusively. He is now one of the jury of the Wavy Awards 2015-2016, a Japanese competition organized by D-Storm and LightWave 3D. Hi Shuhei! Thank you for your cooperation on the LightWave Wavy Awards 2015-2016! You are one of the Wavy Awards winners so we would like you to share your experience to young creators. When did you start using CG tools? When I was a college student, one of the famous CG games, Final Fantasy, just came out and CG videos were all over the place. I always get passionate in the video industry, I loved watching movies like Blade Runner (Ridley Scott), Akira (Katsuhiro Otomo) and of course Hayao Miyazaki's anime as well. I joined an art school and started learning digital techniques in order to create movies. As you all know, CG tools were so expensive at that time and I had to work as part time in a printing company so I could learn CG tools there. But sadly, I couldn't find a CG tool that made me happy to work with. Fortunately, I had the chance to join Kamikaze Douga's team and this is where I started using LightWave 3D. How did you feel when you start using LightWave 3D? Well, I was really happy to discover LightWave 3D and very excited to use it!! After learning LightWave 3D, I could create whatever I wanted as well as creating any characters, manipulate cameras... It was like I could finally become a director and create my own animation movie. So, it didn't take me much time to learn how to use the LightWave. I learned it while I was creating animation. Most of 3D tools require a lots of time to learn how to use them and understand their functions. But since I wanted to create my works as soon as possible, LightWave helped me to meet my expectations! LightWave is "my pencil"!!! I can draw anything I want. Even if I was a college student, thanks to the inexpensive price of LightWave, I could buy a personal license for myself. And I finally became able to create 3DCG works not only for Kamikaze Douga, but also for my own projects. How did you become a professional creator? When I joined Kamikaze Douga, we were only 3 people. At that time, we were going crazy for Akira (Katsuhiro Otomo) as for the amazing and very popular animated music video Extra (Koji Morimoto). We wanted to create these kind of cool anime. At the same time, we found out about the 1999 Japanese LightWave Wavy Awards competition and we decided to create a few minutes full CG Animation video, ioCI. We won the first price. We were so happy! And this is how we became CG professional artists. This competition was our beginning, our “Origin”. Because there were quite lots of other great works during the 1999 Japanese LightWave Wavy Awards, receiving the first prize was really great! How did you feel about it? We were really thankful for receiving the first prize at the Wavy Awards. My life changed and I move forward and became a professional creator and artist. Since then, I was able to take part of some works as creator, either as a CG director or artist all the way to the present day. Being the director on Tsukumo (Sunrise) helped me a lot. We won an Academy Award nomination for Best Animated Short Film for this movie in 2014. We were finally allowed to walk on the red carpet. Would you mind giving your message to young creators? If you participate in the Japanese LightWave Wavy Awards competition, you can have a lot of opportunity! Like me, your life can be changed by such a great experience! Mine was…and all because of my favorite creative tool LightWave giving me the tools to make this possible. Please look also for your own “pencil” or creative tool! LightWave worked so great for me and has allowed me to do so much in my life! LightWave made it possible for me to translate the images inside my head and make them real which is so exciting for me creatively. And it was so much simpler to use than other 3D software tools for me. I am expecting to see new artists cool work at the Japanese LightWave Wavy Awards 2015-2016 and you may be able to work with us in future. Will you hire some ambitious creator? Sure! We are always looking for talented people to join our team, see you at the LightWave Wavy Awards ceremony! Thank you Shuhei for taking the time to speak with us! See you at the Wavy Awards ceremony! Interview originally published in Japanese on D-Storm website.